The Chicago Bears were a team in transition as they faced the New York Giants on November 16, 1930. Coming off of a disappointing 4-9-2 record in 1929, the Bears were in their first season under Head Coach Ralph Jones, with George Halas concentrating on front office duties. Jones revamped the offense and benefited from the arrival of two rookies in the backfield, QB Carl Brumbaugh and power-running FB Bronko Nagurski (pictured at right). Thus far the Bears were at 4-4-1 as they faced the Giants, a powerful club under Head Coach Roy Andrews that had a 10-1 record including five straight wins at home and an offense that featured tailback Benny Friedman, the best passer in pro football. There were 5000 fans in attendance on a rainy day at the Polo Grounds and the field was muddy. The teams slogged through three scoreless quarters, with Chicago’s ground game dominating. Early in the first quarter, the Bears drove from their 27 to the New York 15, but the visitors came up empty when three runs and a pass came up short and they had to turn the ball over on downs. In the third quarter, Chicago put together another promising drive fueled by the running of Bronko Nagurski and halfbacks Red Grange and Joe Lintzenich. But after reaching the New York six, the Bears again failed to reach the end zone and had to turn the ball over on downs. Early in the fourth quarter, the Bears took possession at their 41 and again moved the ball effectively. 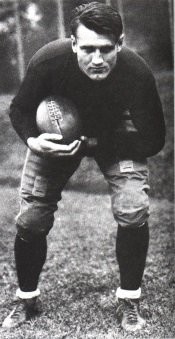 Nagurski ran for nine yards, Grange gained enough for a first down and followed up with a pass to end Luke Johnsos for 28 yards to the New York 22. Carries by Grange and Carl Brumbaugh got the ball down to the seven and Nagurski barreled over for a touchdown from there, but Garland Grange failed on the extra point attempt. The Giants started out deep in their own territory following the kickoff. Benny Friedman came out passing, but his third toss was intercepted by Lintzenich at the New York 20. He returned the ball to the 10 and, four plays later, Nagurski dove into the end zone from a yard out for a second touchdown. The try for point after was again unsuccessful, but it was of no consequence. Chicago won by a final score of 12-0. The Bears led in first downs (13 to 5) and otherwise dominated the game. It was a precursor of good things to come as they won their remaining four contests to finish with a 9-4-1 record that placed third in the league standings. New York defeated Green Bay in a key battle the next week but lost two of four to finish second at 13-4. For Bronko Nagurski, the two touchdowns against the Giants were part of five that he scored on the year. He received second-team All-NFL honors from Collyers Eye and the Green Bay Press-Gazette.